Betsy DeVos, President Trump's Secretary of Education, gave a speech a few days ago in which she candidly acknowledged that the federal student-loan program is in crisis. In fact, she compared the student loan program to a "thunderstorm loom[ing] on the horizon." The federal government holds $1.5 trillion in outstanding student loans, one third of all federal assets. Only one in four federal student-loan borrowers are paying down the principal and interest on their debt. Twenty percent of all federal student loans are delinquent or in default. That's seven times the delinquency rate on credit card debt. The debt level of individual borrowers has ballooned since 2010. Most of this growth is due to the fact that postsecondary students are borrowing substantially more money than they did just eight years ago. The federal government's portfolio of outstanding student loans now constitutes 10 percent of our nation's total national debt. DeVos basically admitted that a lot of federal student loans will never be paid back. In the commercial world, she said, no bank regulator would value the government's massive portfolio of student loans at full value. And she also admitted that the Department of Education, by itself, could only make "a few, small tactical measures" to address this enormous problem. In my view, DeVos's speech is the most useful statement about the student-loan program coming from a federal official since the publication of A Closer Look at the Trillion, released more than five years ago by the Consumer Financial Protection Bureau's Student Loan Ombudsman, Rohit Chopra. As I have said repeatedly, the student-loan crisis will not be resolved until the for-profit college industry is shut down and struggling debtors have access to the bankruptcy courts to discharge their student loans. Congress should adopt legislation banning the federal government from garnishing the Social Security checks of elderly student-loan defaulters. As the Government Accountability Office pointed out two years ago, most of the money collected from garnishing Social Security checks goes to paying off interest and penalties and not paying down the principal on the debt. Disabled veterans should have their student loans forgiven automatically by the government without the necessity of making a formal application. The Department of Education should streamline the loan-forgiveness process for borrowers who signed up for the Public Service Loan Forgiveness Program (PSLF). As of a few months ago, DOE had approved less than 100 of 28,000 PSLF applicants. 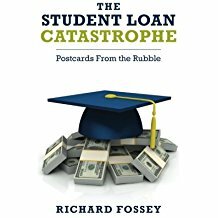 Insolvent tudents who took out private student loans and financially distressed parents who co-signed student loans for their children or who took out Parent PLUS loans should have free access to the bankruptcy courts. These measures, if adopted, would do little to relieve the massive suffering caused by mountains of student loan debt. But they would be a token of good faith by our government and a sign that our political leaders finally understand that the federal student loan program is out of control and has ruined the lives of millions of Americans who took out student loans in the naive hope that a college education would lead to a better life. Rohit Chopra. A closer look at the trillion. Consumer Financial Protection Bureau, August 5, 2013. Accessible at: http://www.consumerfinance.gov/blog/a-closer-look-at-the-trillion/. Betsy DeVos. Prepared Remarks by U.S. Secretary of Education Betsy DeVos to Federal Student Aid's Training Conference. November 27, 2018. United States Government Accountability Office. Social Security Offsets: Improvement to Program Design Could Better Assist Older Student Borrowers with Obtaining Permitted Relief. Washington DC: Author, December 2016).